Each year, 6. 1 million kids aged 6 to 17 play soccer for more than 25 days a year, and each of their teams needs a coach. In many cases, the coach is a parent or adult volunteer who may not have any previous coaching (or even soccer) experience. 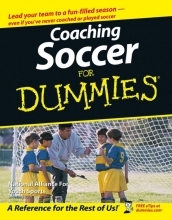 This book provides these volunteers with a crash course in soccer and coaching fundamentals. Part I: Getting Started Coaching Soccer. Chapter 1: Teaching Soccer to Children. Chapter 3: Getting Up to Speed with the Basics. Part II: Building Your Coaching Skills. Chapter 5: Getting to Know Your Team. Chapter 7: Getting Your Game On. Chapter 8: Refining Your Approach at Midseason. Part III: Beginning and Intermediate Soccer. Chapter 9: Teaching the Fundamentals. Chapter 11: Coaching Offense 101. Chapter 12: Coaching Defense 101. Chapter 14: Taking Practice Drills to the Next Level. Part IV: Advanced Soccer Strategies. Chapter 17: Implementing Advanced Drills. Chapter 18: Keeping Kids Healthy and Injury Free. Chapter 19: Dealing with Common Coaching Challenges. Chapter 20: Taking Your Show on the Road. Chapter 21: Ten Ways to Make the Season Memorable. Chapter 22: Ten Ways to End the Season on a High Note.